If you are a bearer of fine hair, than you understand how important a curling iron and other quality fine hair care tools can be to create volume, bounce, and texture in your naturally limp locks. If you have recently purchased a new curling iron or are in the market for a new one, you will notice on your trip to the drug store that there are several different types. 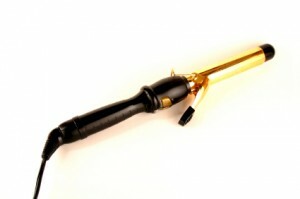 Gone are the days of the aluminum curling iron that can stress out your hair as easily as curl it. So, what is the difference between these new materials? From metals to crushed gems, each material claims different (and the same) qualities to ensure the health and beauty of your hair. Ultimately, it all boils down to what you are used to; speed vs. results; even heating and extra shine; etc. With all of the new materials that have been found to improve curling irons today, there are also several that are made from a combinations of materials. Below you will find materials that curling irons you can typically find in the store or online are made from and the benefits of each. A simple aluminum curling iron can be bought for as low as $8 at the store, but with these you run the risk of burning your hair, drying it out, longer curling time, and product buildup on the iron itself. With these newer materials, there is little variation in price (price is usually greater or less depending on the brand), typically between $20 and $40, and you can rest easier knowing they are faster, less damaging, and avoid a product buildup. Ceramic: By far the most popular type of curling iron on the market right now, ceramic irons are dependable and lightweight, delivering a gentle, even heat that is just right for fine hair. The negative ions produced by the ceramic will not strip the hair of its natural moisture, but will smooth the hair, preventing static or frizz. Tourmaline: This gem is rich in negative ions, crushed and usually combined with ceramic to create a curling iron that smooths as it curls and claims to produce a longer lasting curl. The tourmaline adds shine to the hair and prohibits the growth of bacteria. Titanium: This is an extremely lightweight metal, making it a favorite among people with hand or wrist issues. This lightweight metal produces high heat, which in turn produces a pronounced curl without, but its smooth surface won’t tug your hair. Titanium is also a corrosion-resistant metal and highly durable, meaning you can expect it to last for a long time. Teflon: Used as a coating over curling irons made from various materials, Teflon makes certain that your hair slides smoothly and provides protection between your hair and the metal and makes the iron easy to clean. Barrel size: If your hair is longer or thicker, you will require a thicker barrel. Coating: Make sure the curling has a coating, such as Teflon, or is made from a material such as those listed above, to ensure smooth gliding of your hair an easy cleaning. Even heat distribution: Curling irons made from these new materials provide even heating, while formerly-used metals, such as aluminum, fluctuate in temperature and can damage hair in one spot while not providing adequate curl in another. Also, if you have a fine hair, make sure to use the lowest heat setting possible to achieve texture to avoid heat damage. Using quality tools: curling irons, hair dryers, and the right hairbrushes for fine hair is critical in creating a lasting style and healthy hair!